Chinese good luck symbols take many forms, such as Chinese characters, statues of dragons, golden cats and red envelopes. These good luck symbols can also be used with specific elements as cures and enhancers for various feng shui applications. There are many Chinese symbols of good luck that are represented by objects and visuals, each having a strong purpose and significant meaning. Often used in the practice of feng shui, good luck symbols strengthen positive energy, rejuvenate stagnant energy and act as cures as they draw auspicious chi into the home or workplace. 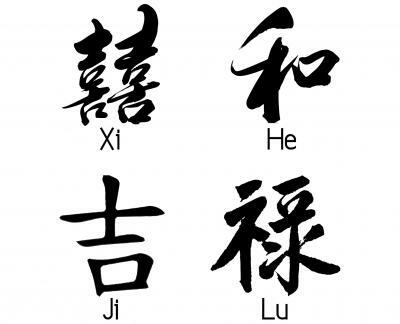 One of the most popular Chinese symbols of good luck is the pinyin (official transcription system for converting Chinese characters to Latin script) characters for fu which represents good luck or good fortune. 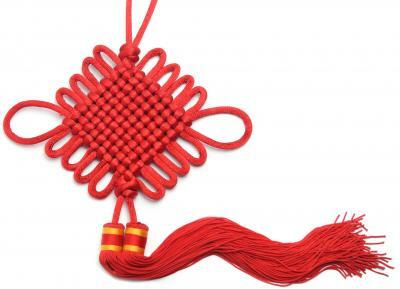 The ancient Chinese tradition of hanging a fu symbol on the front door is still practiced during the Chinese Spring Festival and Chinese New Year. This practice began in 256 B.C. during the Zhou Dynasty to keep the Goddess of Poverty from visiting and residing in your home. Today, the symbol represents a year of good luck, prosperity, and happiness. 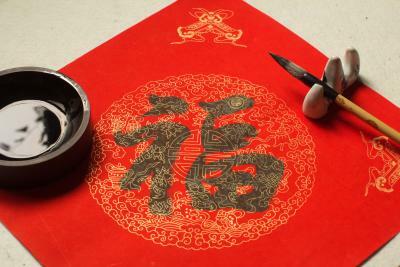 Artists often draw fu symbols in black ink calligraphy on red paper to be hung in homes as a feng shui cure to attract positive energy. These beautiful good luck symbols are also popular in jewelry as charms and pendants. Xi: Popular at Chinese weddings, this symbol represents double happiness and good luck. He: This is a good luck symbol for harmonious relationships. Ji: Give this Chinese symbol for good fortune and a wish that all is well for a housewarming gift. Lu: Prosperity, good fortune and wealth come with this Chinese character. The Imperial Dragon fathered nine dragon sons. Ancient Chinese culture believed the emperor to be a direct descendant of the dragon. 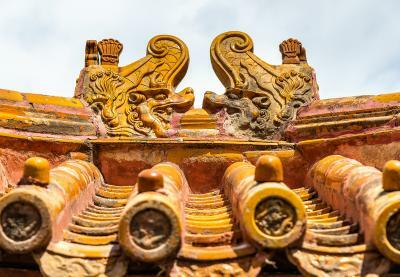 You'll find the dragon motif throughout Chinese architecture. Some dragon names are spelled differently depending on the region of the country, but they all retain the same properties. Baxia (Bixi): The most commonly recognized symbol is the dragon tortoise (turtle dragon). He is powerful and strong and capable of bearing life's burdens. He brings long life of prosperity and strength. Bi An (Bian): This dragon is a protector of the law and considered a fair judge. Use this auspicious symbol for any legal issues you may face. Chi-Wen (Chao Feng or Chiwen): This dragon governs water and is used on roofs to ensure protection against fire. Place one inside your home to protect against natural disasters such as floods. 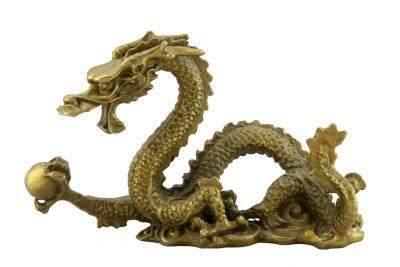 Gongfu (Gong Fu): This water dragon god enjoys swimming in lakes and other bodies of water. He brings wealth to your home and protects you from floods and is often used on ships. Pu Lao (Puloa): This dragon roars and rules over sounds. It is often used as a motif for temple bells. Place one on your desk to command authority. Ch'iu Niu (Quiniu): The dragon god loves music and is the creative symbol often found carved onto musical instruments or as a relief motif. 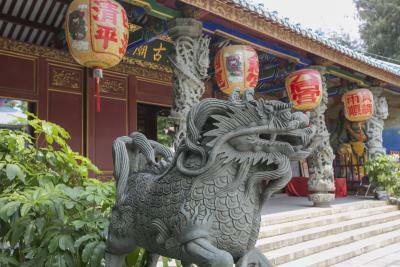 Suan Ni (Suanni): The lion dragon of fire and smoke sits and watches over his kingdom. This dragon god bestows wisdom and great wealth to those who use this symbol. Taotie (Tootie): If you need wealth, add a token of this food-loving dragon with bronze and other metal bowls, plates, and other serving pieces. Many china patterns include an image of this dragon god. According to the World of Feng Shui website, a product of Lillian Too, renowned feng shui master, cats in Chinese mythology are typically bad omens, unless they are golden cats. The latter color of cat signifies the transformation of what might be a very inauspicious event into one with an auspicious outcome. The symbol of the lucky cat or golden cat symbolizes the transforming of evil into good that this symbol is one of protection against evil. 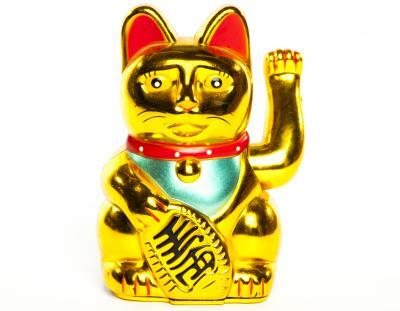 This two-sided statue is an unusual feng shui symbol of good luck, abundance, and protection. One side depicts a smiling cat with a raised paw designed to attract wealth by representing good luck and good fortune. When the statue is turned around, it reveals a frowning cat holding a broom to symbolize protection by sweeping troubles and worry away from you. Buddha statues are available in many styles and designs. One of the most popular Buddhas is the Laughing Buddha, sometimes called the Happy Buddha. The Laughing Buddha with his round belly and big smile is a symbol of good luck, abundance, and prosperity. There are some symbols that are also used for lucky charms. These are very popular symbols and can be placed in your home and a few can be carried with you throughout the day. 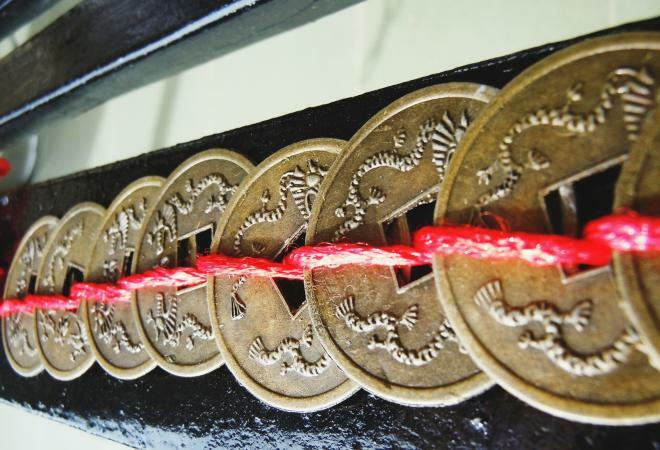 Three Chinese lucky coins tied with a red ribbon will bring you luck. 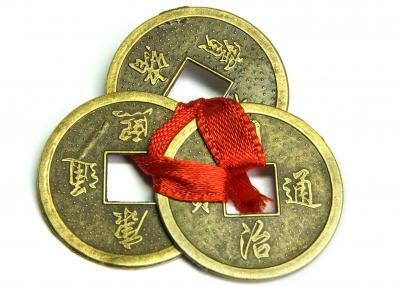 Place Chinese good luck coins in the Southeast sector of your home or carry inside your purse for an abundance of wealth and money. Carp (koi) and goldfish Use eight red and one black fish in an aquarium or koi pond. Place aquarium just inside front door, on the north wall or in the southeast sector of home to stimulate wealth. Red envelopes are used for gift-giving, but you can also use for yourself. 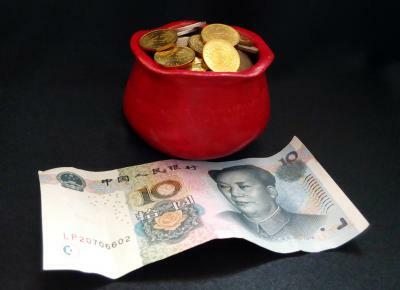 Red envelopes hold one coin (from a positive dynasty). Give as housewarming gifts, carry one inside your purse for abundant wealth. Wealth pots are an ancient symbol used for activating wealth. Fill this with money, especially money from wealthy people, other symbols of great wealth and place inside your house in the wealth corner, which is the southeast one. The three-legged toad is a symbol used for a lucky charm. This toad is always depicted with a coin in its mouth with a Chinese character coin side facing up. Place in the southeast corner facing into home or room. Crystals are a favorite symbol that's used to activate earth chi energy by placing the crystal in southwest, northeast, or center of your home. Mystic knots are used by themselves as well as in unison with other good luck symbols. These knots of happiness are the eternity symbol of the figure eight. Use the mystic knot to hang various feng shui cures such as wind chimes and coins. You may wear or use specific Chinese characters, such as the ones for health, wealth and other auspicious words. Select a good luck pendant necklace or place a Chinese character in its correlating sector, such as the health (east) or wealth (southeast) sectors. You can capitalize on the two traditional auspicious colors to attract good luck. Red is the royal and national color that translates to wealth and power. Black is a color of wealth. The combination of red and black are considered auspicious in feng shui applications. You can also use Chinese lucky numbers in your home to convey the energies they attract. Use can also use these lucky numbers as a guide for selecting your next home address, phone number and other instances where a number is needed. Each number vibrates to a specific energy that you can tap into and take advantage of its chi energy. These and other symbols of good luck can be used in feng shui applications as powerful cures and enhancers for activating chi energy. Pay attention to the material the symbol is made from and place it in the appropriate sector of water, wood, fire, earth or metal. If you adhere to feng shui principles, you can significantly improve your life and your luck.